The United Nations joined the African Union today hailing the inaugural 'Africa Day of School Feeding,' as part of a key strategy to address the continent's development challenges through home-grown school meal programmes. Celebrating the launch of the Day, the African Union (AU) and UN World Food Programme (WFP) highlighted the vital role of school meals in education as the world's most widely used safety net. School meals provide critical social support, encouraging more regular attendance at school and contributing to children's protection in emergencies. They are also a key long-term investment in millions of people's futures, in local economies, and in reducing hunger across the globe. “Further, when it comes to encouraging girls' access to school, adding just one year of school meals is proven to increase absolute enrolment by nearly 30 percent,” said WFP Executive Director Ertharin Cousin. “School feeding programmes are not new to Africa, in fact, some among us became who we are today because of school meals,” said Nkosazana Dlamini, Chairperson of the African Union Commission, adding however that the link with local food production is a new approach. The Day focuses on home-grown school meals, where local farmers produce food that is then purchased for use in school meals, maximizing the benefits for students, farmers and local communities. According to an analysis conducted by WFP, every dollar spent on a school meals programme can result in a return worth as much as $3 to $9. More than half the world's children assisted by WFP with school meals live in Africa. In 2014, over 10 million children in 41 African countries benefited from WFP school meals programmes. 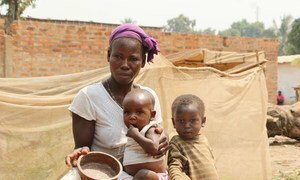 An emergency food security assessment by the United Nations World Food Programme (WFP) and its partners has revealed that half the population of the Central African Republic (CAR) – nearly 2.5 million people – faces hunger.